The Kawarau and Shotover Rivers make Rafting in Queenstown the best in the country. It doesn't matter if you're a first timer, there are rapids of all grades to suit all levels. Grab your paddle and your crash helmet, and hold on tight. 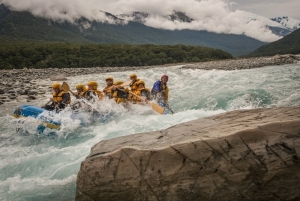 Queenstown Rafting is exhilarating, exciting and essential to any visit to this adventure capital of New Zealand. The rivers here are fast flowing and are surrounded by vast cliffs and canyons that are just perfect for rafters. All the companies who operate here have decades of experience, so whether you're holding on tight to your fellow rafters, or sitting on the edge of the dinghy, clawing away at the white water, this is something you'll never forget. There are rafting trips that offer half day trips down the Kawarau and Shotover Rivers, plus 'combo' packages to include other activities like abseiling, kayaking and bungy jumping. A bit further out, gives you the option to raft Skippers Canyon. If you have children (or green adults! ), there are also more sedate rafting trips over Grade 1 or 2 rapids.